King David understood the power of a bursting flood when God swept away his enemies. How did he achieve this phenomenal breakthrough? What secrets can we learn from him? We can learn much from the life of King David because he was a man after God’s own heart. This story is about how King David achieved a massive breakthrough over his enemies. So David went to Baal Perazim, and David defeated them there; and he said, “The Lord has broken through my enemies before me, like a breakthrough of water.” Therefore he called the name of that place Baal Perazim (which means “the Lord who bursts through“). Once again, the Philistines deployed themselves in the Valley of Rephaim. David inquired of the Lord but this time God said, “You shall not go up; circle around behind them, and come upon them in front of the mulberry trees. And it shall be, when you hear the sound of marching in the tops of the mulberry trees, you shall advance quickly. For then the Lord will go out before you to strike the camp of the Philistines.” When David followed God’s commands, he defeated his enemies once again. King David understood the power of a bursting flood when God swept away his enemies. He achieved a phenomenal breakthrough at Baal perazim where he defeated his enemies.. He made it a point to first enquire from God as to the specific course of action to take. He followed whatever God instructed him to do. He gave glory to God for his success. After his initial victory at Baalperazim, the Philistines returned and confronted him again. Lesser mortals would have rested on their laurels, overconfident in light of earlier victory. “No sweat; let’s go and defeat them.” But David was different. He enquired of the Lord again. Described as a ‘man after God’s own heart’, David frequently sought God for counsel and direction. He had this inclination to enquire of the Lord whenever he had an important decision to make. This distinctive characteristic sets him apart from the other heroes of faith in the Old Testament. David had one consuming desire. He wanted to continually dwell in God’s presence and gaze upon God’s beauty. His deep intimate relationship with God underpinned many of his actions and exploits. Though he was king, he knew the One who was responsible for his success. “And David knew that the Lord had established him king over Israel” (2 Samuel 5:12a). He did not depend on his might, riches or wisdom, knowing deep down it was God who had raised him from obscurity—from shepherd boy to royalty. As a shepherd boy, he knew that God was the One who delivered him from the lion and the bear who preyed on his sheep (1 Samuel 17:37). 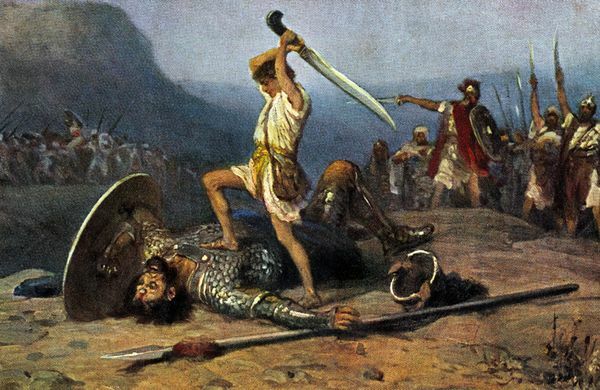 Later, through a self-esteem built over the years by intimacy with God, he was unafraid to confront Goliath using just a sling and a few stones (1 Samuel 17: 45). It was this same humility and dependence upon God—whether he was a shepherd boy or king—which led David to seek God as to how he should confront his enemies who were preparing to attack just after his coronation as king. How did David enquire of the Lord? He could have sought God’s face and prayed and/or consulted the priests who sought for divine guidance using the Urim and Thummim. What can we learn from King David? Just as David did not rely on his own wisdom or strength, we should seek God through prayerand studying the Word and allow the Holy Spirit to show us the path that He would have us take. We should cherish times of spiritual intimacy with God for it is through such times that we get a sense of his counsel and will. We should never take things into our own hands and move ahead before God’s timing. At times, the answer may not be clear and that’s when we need to wait. Moses also sought God before leading the Israelites into the Promised Land. He cherished God’s presence with him—more than blessings—in all his endeavours. If God’s presence did not go with him, he would not think of possessing the land flowing with milk and honey (Exodus 33:15). Thus says the Lord: “Let not the wise man boast in his wisdom, let not the mighty man boast in his might, let not the rich man boast in his riches, but let him who boasts boast in this, that he understands and knows me, that I am the Lord who practices steadfast love, justice, and righteousness in the earth. For in these things I delight, declares the Lord” (Jeremiah 9:23-24). This Book of the Law shall not depart from your mouth, but you shall meditate on it day and night, so that you may be careful to do according to all that is written in it. For then you will make your way prosperous, and then you will have good success (Joshua 1:8). For all who are led by the Spirit of God are sons of God (Romans 8:14).